fast-growing traffic to ensuring optimal application performance no matter how quickly business needs or the enterprise environment evolve. At the same time, IT must reduce costs and datacenter sprawl, ensure security and uptime, and prepare for a new generation of cloud computing initiatives. While many Application Delivery Controller (ADC) solutions promise to meet demanding customer needs, the reality often falls short. 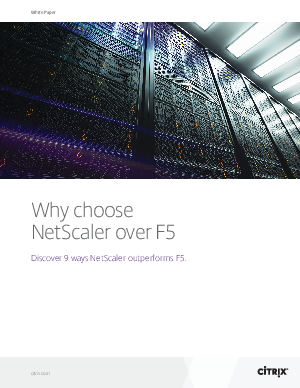 Taking a closer look at the available options and how they measure up against the criteria that matter most, it becomes clear that NetScaler beats the competition—providing better performance and scalability than F5 Networks, Inc.